Instead of £56.00. You save £2.80 due to the online discount . The Flexiboxx brochure rack provides a good presentation platform for brochures and information materials, either in portrait or landscape format. As it is mounting on the wall, it is particularly space-saving. The high-quality wall rack for brochures with 12 compartments is suitable for the clear presentation of brochures, leaflets and information sheets. The compartments provide plenty of space for a large amount of materials and documents. They are configured so that the content can be easily and quickly removed. The wall-mounted brochure racks can be combined as required so that additional storage space in a uniform look can be quickly and easily created. The rack also makes a good solution for a pre-sorting station. 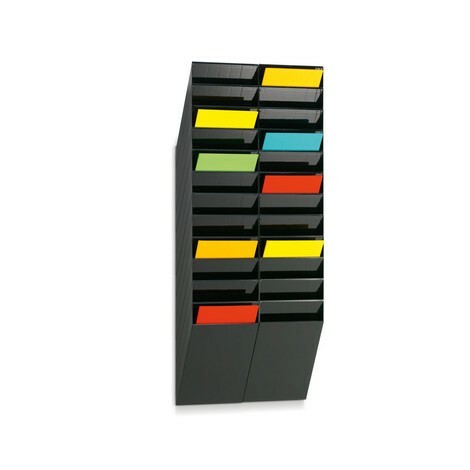 The brochure rack is available in different colours and dimensions. The filling height of a compartment is 24 mm. Delivery includes mounting material for attaching to the wall. Order the Flexiboxx brochure rack from our shop.